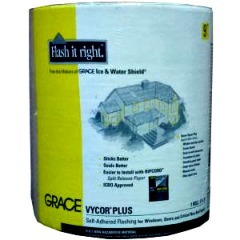 Vycor flexible flashing is brand owned by W.R. Grace that covers a range of construction products that consist of a butyl-based adhesive on one side and a thick layer of polyethylene on the other. Polyethylene is a type of plastic. The butyl material resembles asphalt. You have a gooey mess on one side and plastic on the other, but together you have a great product for flashing and sealing around doors and windows. By way of warning let me emphasize that I do not have a commercial relationship with Grace or Vycor. I merely relate what I have experienced. There may be competitor products that are just as good. In the Vycor line of flexible flashing products you have various widths and lengths of rolls and you also have various treatments of the polyethylene. For instance Grace Vycor Aluminum Flashing has a layer of aluminum on top of the polyethylene. Grace Vycor V40 Self-adhered Flashing has a protective coating so that the flashing can withstand years of exposure to the sun and elements. They even use thinner strips to protect the tops of deck joists. The water that flows between the deck boards will roll off the Vycor rather than soaking into the top of the joist. The product I used is known as Grace Vycor Plus Self-adhered Flashing. 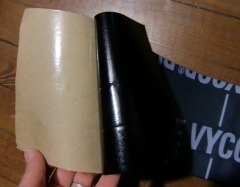 It came in a roll 6” x 25’. I can’t remember the cost, but it was in the $10 range. It is available at both Home Depot and Lowes, but not in all sizes. It is easy to use, despite its sticky nature. It has a peel-off layer, so you can handle it with ease up until the point that you remove the backing. The asphalt material has a little depth to it. It will conform around any texture or contours on the surface to which you are adhering it. This makes it superior to mere tape for sealing off openings. It will also stick to any nails poked through preventing water from coming in via the nail holes. I have only used it this one time, but it convinced me that it is a great product. Vycor is also a name used by Corning Glass for certain extremely tough glass products that have nothing to do with home building or flashing.